Mount Bighill is the first level in Quiver Cliffs in the game Wario Land: Shake It! It is a typical Chinese-themed village in the mountains, which is covered with lush bamboo stalks and greenery. A river can also be seen in the distance along with many fleets of ships. 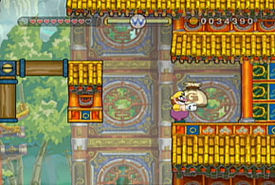 Mount Bighill introduces springs, which Wario can use to reach higher places, where there are usually treasure or coins. By doing a ground pound, Wario can reach very high places on the springs. Also, wooden structures also appear here. Wario needs to do a dash attack to move these. The wooden platforms can also be used to solve puzzles, open new places and reach treasure.